Chevrolet cancels plans to sell the Orlando in U.S. The Orlando was shown in concept form at the 2008 Paris motor show. 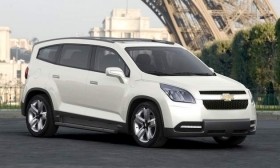 DETROIT -- Chevrolet is canceling plans to sell the Orlando, a seven-passenger crossover, in the United States. The Orlando, based on the Cruze platform, will still be sold in Europe, Asia and Canada. The Orlando was shown in concept form at the 2008 Paris motor show, and a production model has not yet debuted. Chevrolet has a fresh lineup of crossovers and SUVs in the U.S, including the Traverse and the Equinox, which have been well-received. The automaker is also launching the Cruze and the Volt, and the company believes concentrating on its core vehicles makes more sense. The Malibu remains strong in the U.S. midsize-sedan segment as well, Chevrolet said. "We're going to focus our resources on growing those," spokesman Brian Goebel said. "We think we've got today's families covered with those products." The decision was made within the last month and reached up to General Motors North American boss Mark Reuss.